ThemeParkMama: Cool Gear Keeps Food Fresh and Offers So Much More! Cool Gear Keeps Food Fresh and Offers So Much More! I had never heard of Cool Gear until one day my son who is in elementary school brought home the wrong lunch box and inside was a Stayfit Lunch 2 Go container made by Cool Gear. How great was it to finally have a chance to check out Cool Gear. I must admit, my first thought was that this product was work out clothing. I never would have thought food containers but I was wrong. Living in Florida, it's hot, so it's very hard to have lunches with bananas, yogurts, or anything else that is cold. The Stayfit Lunch 2 Go helps with not only organization of your meal but also with cooling. The container has sections so you can have a full meal -not a full meal that is now all together- ......yum..........NOT. There are 3 sections for which you can place your items in making the full portion you would eat at home. An added bonus is that on top of having 3 sections the lid has a cooling pack which while not in use you can place in freezer and it lasts all day long keeping food tight and cold. 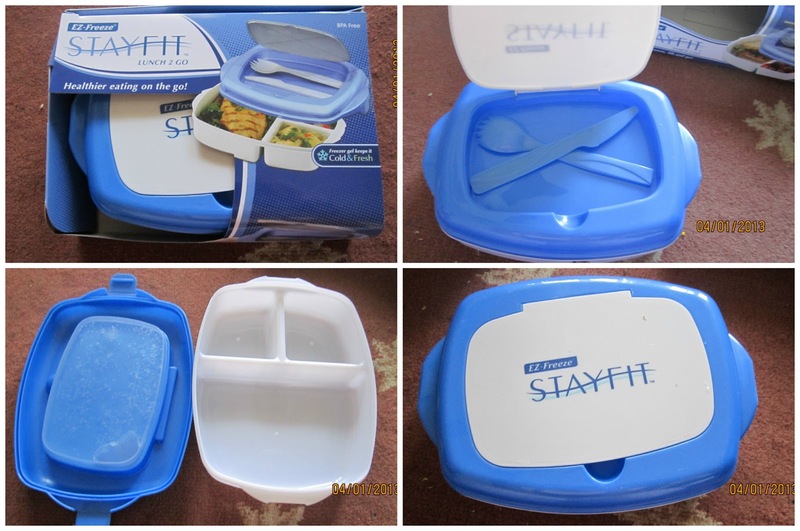 Another bonus is it comes with fork and spoon which is nicely stored on top of the container! It's a great way to have more home cooked meals which helps save you money and is helping the earth since you can reuse it over and over. It washes great in the dishwasher and the lid is easy to pop on and off. The other item I got to try was a huge help for me while I was doing my exercise with the Journey Gym. I hate water, I HATE IT! If I have to drink it, I want it ice cold. I was sent a 24oz EZ Freeze Pure which has a filter system along with a cooling system. 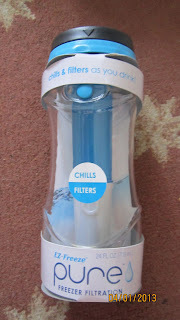 The center of the bottle is a stick which has your filter and an ice pack which when placed in the water keeps water cool all day long. I found myself drinking more water with the EZ Freeze Pure, it made water taste good. The water flows through a channel of the freezer stick giving you cold clean water. What a great product. Cool Gear has many other useful items that can help keep lunches safe, clean and cool all year long. Check out Cool Gear by clicking here. 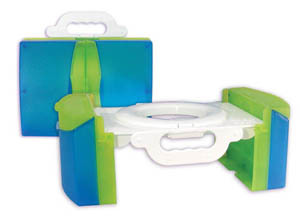 Check out this item, its a fold and go potty seat how great is that! Disclosure: I was given 2 items from Cool Gear to help with my review. All opinions are 100% mine.